Born in 1230 to an important Polish family, her grandfather had founded the Premonstratensian monastery at Zwierzyniec near Cracow where Bronislava’s aunt Gertrude had entered, later becoming prioress at Imbramowice. 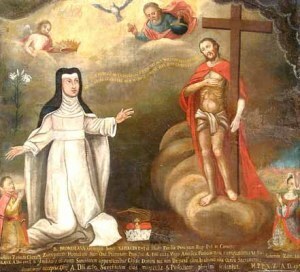 Bronislava was also a cousin of the Dominican Saint Hyacinth and related to Saint Jacek and Blessed Czeslaw. Bronislava entered the convent at Zwierzyniec at the age of sixteen where she was soon afterward elected prioress. 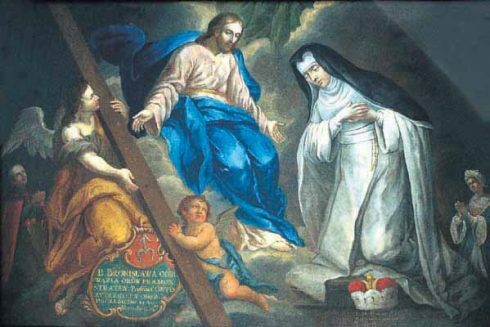 The hallmarks of her spiritual life were her devotions to the Passion of Our Lord and His Holy Cross. When plague came to Poland she quickly set about aiding the ailing and comforting the dying. During the political turmoil that engulfed Poland the convent of Zwierzyniec had to be abandoned on several occasions, situated as it was outside the rampart of Cracow and thus vulnerable to attack. On these occasions the canonesses were forced to seek shelter from the marauding hordes in other religious houses or in the depths of the forests. The worse attack came in 1241 with the invasion of the Tartars. Bronislava with some of her sisters were praying, with arms outstretched in the form of a cross, when they received the news that the savage Tartars were advancing rapidly towards Cracow. The convent was in imminent danger of destruction. Bronislava took up a crucifix, pressed it to her heart and said to her sisters, “Do not fear anything – the cross will save us.” She then led the sisters to the subterranean passages beneath the convent where they successfully remained hidden from the invaders. The convent buildings, however, were not spared, and collapsed in flames, trapping the sisters underground. It is said that when Bronislava knocked three times with her crucifix on a rock wall of the dark prison, a passage to freedom opened for the sisters. After the destruction of the convent, many of the sisters took refuge in monasteries which had been spared. Bronislava remained in the ruins of the old convent with a handful of sisters, building little huts to sleep in and passing the days caring for the poor, the sick, and the countless victims of the Tartar invasion. Bronislava died in 1259, soon after the passing of St. Hyacinth. Ever since then her cult has flourished amongst the people of Cracow and her shrine is the site of many pilgrimages. 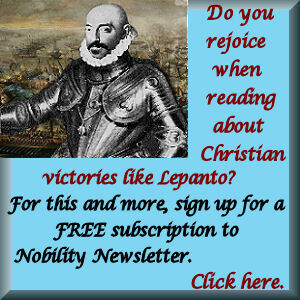 In all eras of Cracow’s history the people have always sought her aid in times of trouble. On August 23 1839 Pope Gregory confirmed her immemorial cult and many hundreds continue to pray for her canonisation. She is considered patroness of a happy death and of the prevention of disease. Thinking of the Islamist persecution of Christians in Africa, India, Pakistan, and the Middle East, one can only pray that God in His Infinite Mercy will do for them what He did for Blessed Bronislava and her fellow nuns, protecting them, and not allowing the enemies of the Cross to discover their hiding place.